Home Features Where’s our bridge? There was a time, not too long in the distant past, when crossing from one side of Sukhumvit Road to the other was not a life-threatening task. A few short years ago the road was just four lanes wide, two going in each direction, with a wide grass verge running down the middle. Cars were fewer in number, and crossing the road, even for a person with a disability, was easy to do. But as Pattaya increased in size, and the number of cars on the road has almost doubled in recent years, Sukhumvit was widened to become eight lanes. A new overpass was built and a road tunnel is currently under construction, which has meant that getting from one side to the other is today almost impossible. Near the junction of Pattaya Klang, outside School No. 5, there is a pedestrian bridge which is used by hundreds, if not thousands each day, but if you have a disability, use a wheelchair or are missing a lower limb, how do you get to the other side? 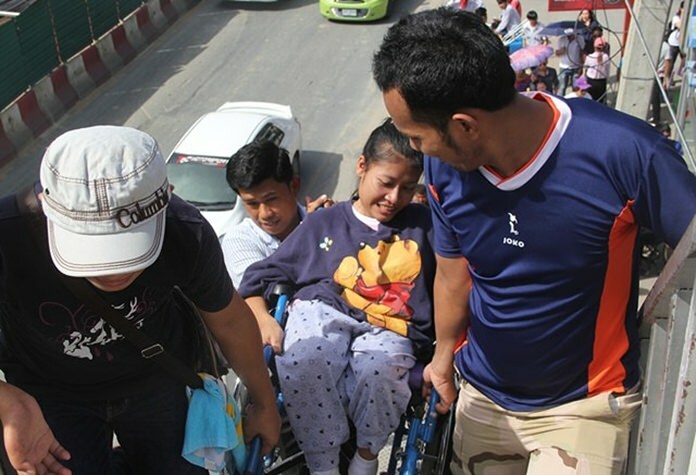 Not too long ago representatives from the Ministry of Transport visited Pattaya, and in particular they visited the Redemptorist Vocational School for People with Disabilities. With much fanfare in front of the local and national press it was announced, and promised, that an accessible bridge would be constructed outside the Father Ray Foundation. An electric lift would carry people up to the bridge where they would then wheel themselves, or walk, across a bridge and then back into a lift to take them down. Since the announcement the students at the school have heard nothing; no start date, no designs, no plans, not even an apology for a delay in the work starting. 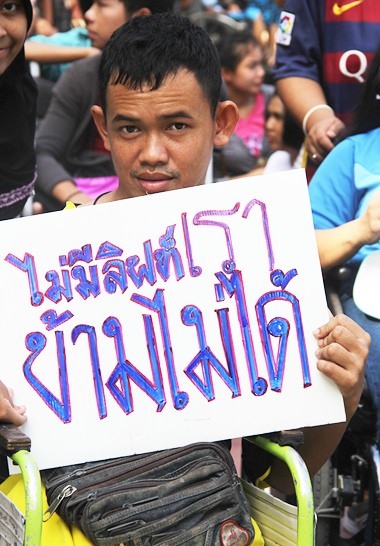 So to remind the people at the Ministry of Transport of their promise, the students recently held a demonstration on Sukhumvit Road, and in front of the local and national media. While he can use both hands to help him climb the stairs, where are his crutches? 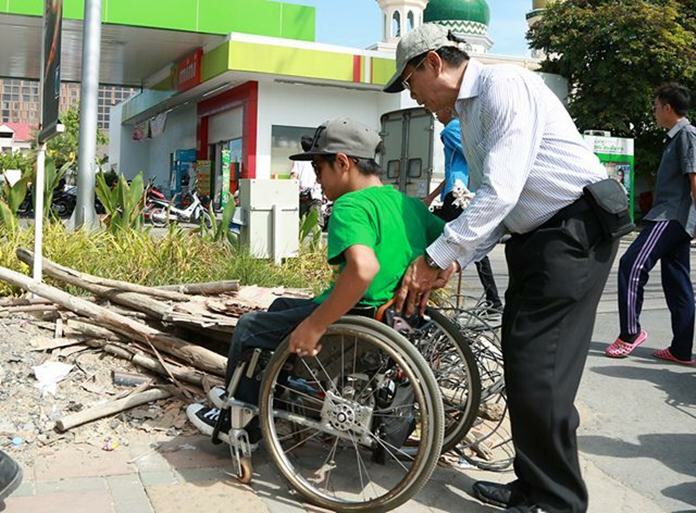 Wheelchair users showed how difficult it is to climb the stairs on Sukhumvit Road’s only food bridge in the city centre. Not just going up, but also coming down the other side. 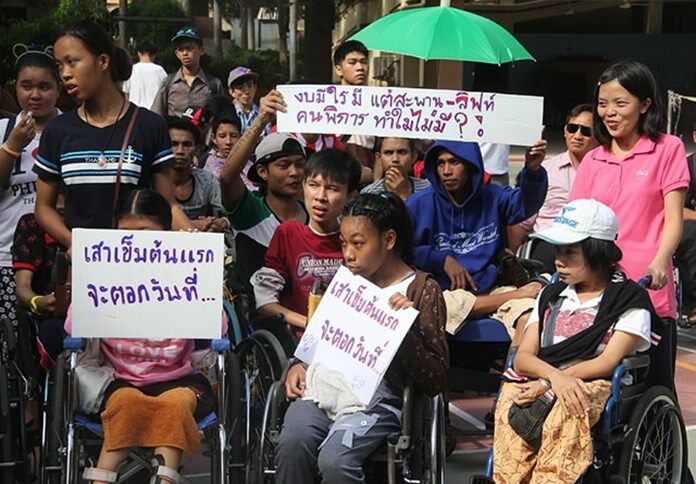 Without help most people with a disability can barely maneuver up the pavements of Sukhumvit, never mind attempt to climb stairs, with a disability and with a wheelchair. It wasn’t too long ago that most people living with a disability would be expected to stay at home, not go to school, to college or to university. It was expected that they would not do much with their lives, becoming reliant and a burden on family members. But today things have changed. 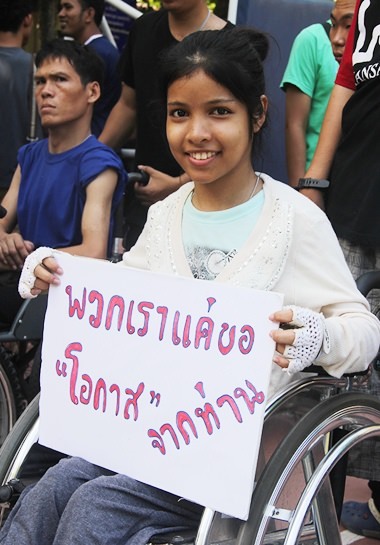 People with a disability want to be educated, they want to be independent, they want to be equal and they want to be able to cross Sukhumvit Road in safety. We can only hope the current Minister of Transport was watching the news channels when this story was aired. The students are asking for what the rest of us take for granted, easy access. One young lady needed four people to help her climb onto the bridge. Just maneuvering along Sukhumvit Road is difficult. Next articleWhat did we learn from the Monaco GP?